It's pretty easy to prepare a picnic shoulder for your meat smoker or your grill. All it takes is a quick rinse and some trimming before seasoning the meat with flavor. 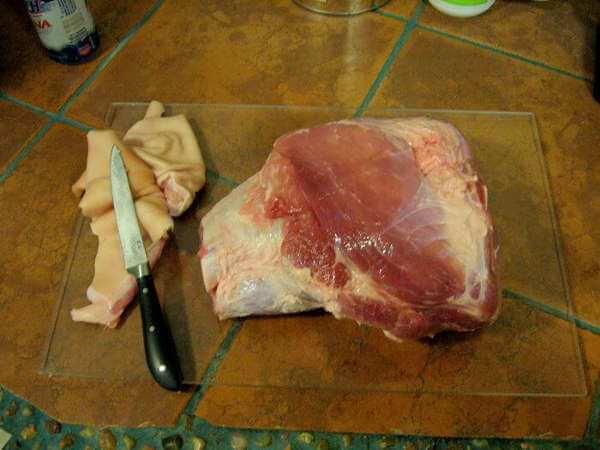 As you can see in the picture, a pork picnic shoulder carries some extra baggage with the meat. Skin covers over half of the entire piece of meat, there are fatty deposits here and there. This is part of the reason that the cut is usually very inexpensive. Another reason is that to be cooked well, it needs to be cooked for a long time. And that's where us smokers come in! It's like pork picnics were made just for us! To prepare the pork picnic for the smoker, the first step is to remove it from the packaging and give it a good rinse in cold water. 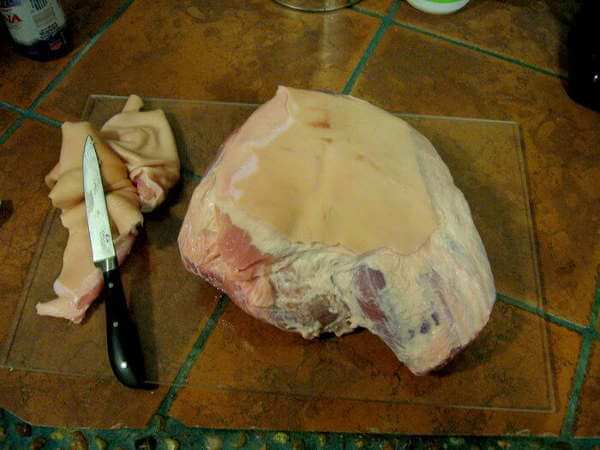 Most all pork is now injected with a solution of salt and preservatives to extend the shelf life of the meat. Rinsing will remove the excess from the surface. The next step is to trim off the skin and excess fat. You can trim all of the skin off, or do like me and leave part of it on. So seasoning flavor can reach the meat on the skin side, it's a good idea to score it just down to the flesh. The side you see in the picture to the right will be placed on top when it's in the smoker. Melting fat will baste the meat as it cooks. If there's a lot of excess fat on the surface, you can trim some of it off. 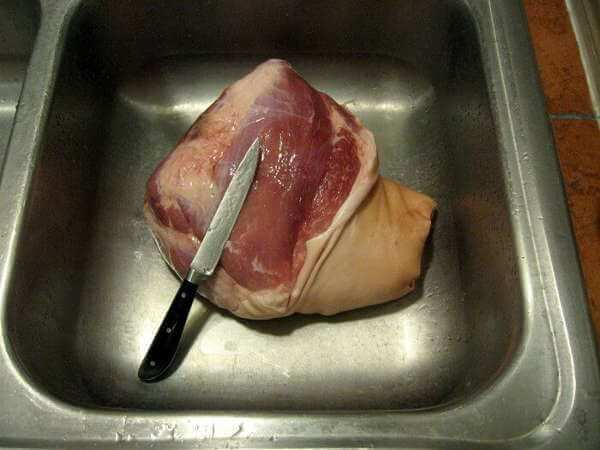 However, most of it will melt as the pork cooks, and you can remove the rest right before you serve it to your guests. The picnic to the right was just trimmed of some skin. No excess fat was removed. Seasoning the pork picnic shoulder is the next step. An injectable mixture of apple or orange juice and seasonings works well for flavoring the meat internally. Use about one ounce of the juice for each pound. Insert the syringe needle fully, then press the plunger as you pull out the needle. Try to inject the liquid evenly through the entire picnic. A good dry rub is just about required for seasoning the outside of the pork. Use a good recipe that's light on the salt, especially if the pork has been "enhanced" with the salt and preservative solution. Read the label and you'll easily see whether or not it's been hit with the preservatives. 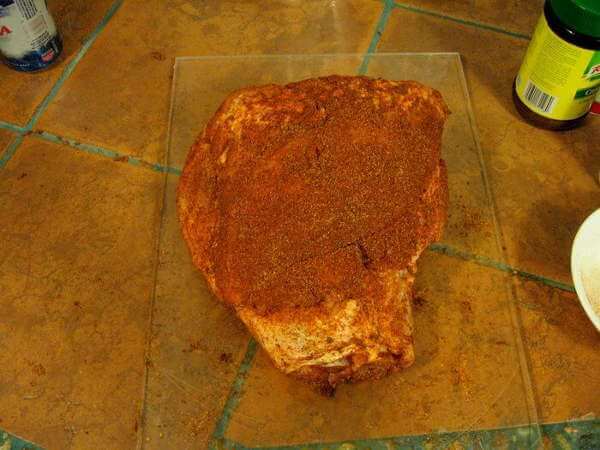 Season all surfaces of the pork shoulder liberally with a rub mixture. Much of the flavor will be carried away as the melting fat and juices drip off. And if you baste it, you'll wash away more of the seasonings. Place the picnic shoulder in a large covered pan and refrigerate it overnight. This will allow the flavor of the seasonings to penetrate the meat fibers. But if you're rushed for time, try to let it rest with the seasonings for at least an hour before smoking. That's all there is to preparing a picnic shoulder for the smoker or barbecue grill. Fire up the smoker!